Naturally, gardeners like to be "green." Here's a fun way to create biodegradable plant pots, save money, and save the environment. We'll use old newspapers, instead of plastic pots, since many of the thin plastic pots used to sell plants can't easily be recycled. that a kids' garden club is going to sell for $1 at the school carnival. Of course you subscribe to the newspaper, don't you? You should! And not just for the articles: newspaper is a fantastic recyclable material for gardening. After all, it comes from trees. That's where paper comes from. And since trees naturally decompose back into soil, so do newspapers. In the olden days, you couldn't make newspaper pots, because there were heavy metals stirred into newspaper inks or used in the papermaking process. They could contaminate the soil where your plants would grow. But not any more! Now most newspaper and inks are made from organic materials, such as soybeans for inks. So you're good to go. Why do we even NEED newspaper pots? Well, if you have already started plants from seed in those small "cells" in flats, they tend to grow quickly, and may need to be transplanted into a larger container for a few weeks before they can be planted in their final home outside. 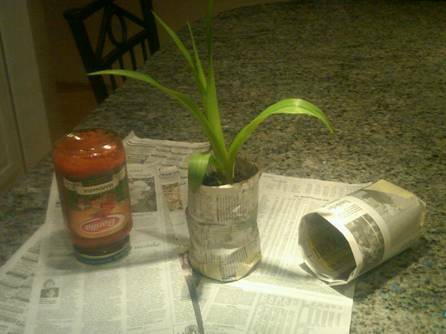 Newspaper pots are only a temporary home, but if you can make them for little or no cost, it's a great cost-savings. The time to transplant a new seedling into its second, larger home is when the plant has gotten its second set of true leaves. The first tiny leaves that pop up after germination aren't really leaves - they are called "cotyledons" - kot tle EE dins - and they provide food for the little plant embryo that emerges from the seed. After two more sets of larger leaves appear, you may choose to transplant each plant into a larger pot - made of newspaper! Then you can either rip off the tape and plant the pot, newsprint and all, into the soil, or dump the soil ball out of the newspaper pot at planting time, and recycle the newspaper for use another way. 1. Lay out single sheets of newspaper, or cut them in halves or thirds, depending on the size of pot you want to make. Decide on your pot size based on what plants you are going to put in the pots. A garden club that is potting up larger perennials, such as iris or peonies, that have some pretty big roots, might want a 5" to 6" wide newspaper pot formed around a large can of beans or family-size soup can. But a club starting tiny seeds of vegetables or flowers might use a plastic cup or jelly jar that is only 2" or 3" across. Maybe you'll make two or three different sizes and have some choices at transplanting time. Lay out a piece of waxed paper, and cut several strips of masking tape into strips a couple of inches longer than your pot bottom. By laying out the strips of tape in advance, it will make it easier for you to get the tape on your "pot" while holding the pot together with one hand. Now roll your first pot! Roll it around your jar or glass as straight and snug as you can. It's good if a few inches of newsprint hang over the bottom of your jar. They will form the bottom of your pot. Place the cylinder that you've made on the table, and with your hands, fold four "flaps" down toward the middle from the left, right, up and down sides. There's your pot bottom! While holding the bottom down with one hand, grab a strip of masking tape. Lay it over the folds. Press down. Now take a second piece of tape, and lay it over the folds in another direction, to make a cross of tape. That's a secure bottom! Wearing rubber gloves to protect your skin from infection, moisten potting soil with a little lukewarm water, and plant your living plant or seeds according to planting directions. Water in with additional lukewarm water, but don't get it too wet. Keep your newspaper pots in a plastic tray or on pavement so that you can water them until it's time to plant them in your garden, or sell them for a profit! The newspaper will hold up for weeks, but your plants will probably be happier in the ground or a permanent pot for most of the growing season.